At the end of 2014, I had the chance to review an absolutely fabulous book, Exploring Christian Theology: Volume 1. 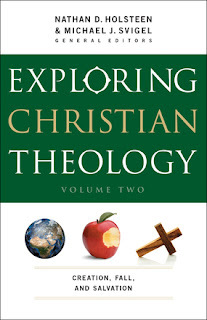 So when I was offered Exploring Christian Theology: Volume Two by Nathan D. Holsteen and Michael J. Svigel, you better believe I jumped at the chance. The first volume focused on "Revelation, Scripture, and Truth" in part one, and "God in Three Persons: Father, Son, and Holy Spirit" in part two. Volume Two also has two sections. The first is "Creation, Humanity, and the Fall." Part two is "Gospel, Atonement, and Saving Grace." This volume is absolutely as fantastic as the first. Now that I have two of the three volumes, it is a bit easier to talk about what I like with this series. I love the "in Retrospect" sections. Tracing what was generally believed in various time periods is just fascinating to me. Similarly, the Voice from the Past and Present section, also split into the various periods, gives real words from real people. I enjoy that. I'm a bit of a history geek, so that is likely a big part of it. The Dangers to Avoid is probably my favorite though. This seems really practical to me. I described it above as talking about heretical types of thinking, but that just sounds so formal and old. It isn't. It's talking about what society today has to say about these issues, and why that is wrong. And it does so in a way that grabs my attention, referencing books, advertising jingles, and even using The Lord of the Rings as an example of what we ought to be doing.